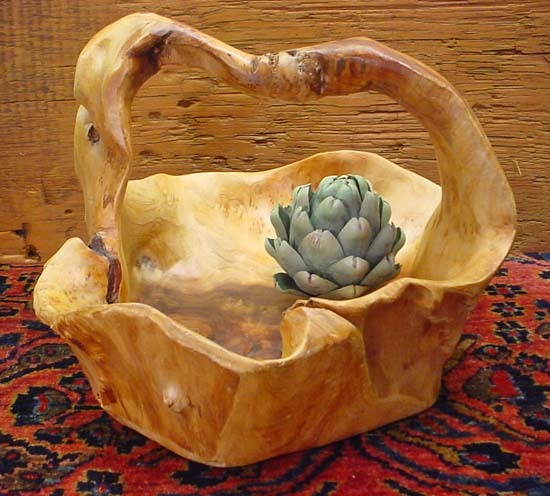 Cedar Root Basket - Large Discounts Apply ! This Large Cedar Root Basket is a natural wonder. This unique basket is carved and fashioned each from an individual and unique cedar root structure. Therefore each one will vary indefinitely from the sample item pictured in this listing. They all have a handle. Like all natural the color and grain will vary. Most of these large baskets do not exceed a maximum width of 14" or a maximum height of 10" They are fine for serving dry foods. For liquids, place in a bowl first then set the bowl into the cedar basket. Truly versatile! Care: Keep away from heat (vents, etc.) and water. To clean, wipe with a damp cloth.